Here is our list of 10 Movie Outtakes That Made It To The Big Screen. Just about every movie fan has seen the Star Wars saga at least once, but there's a good chance even die hard fans have overlooked one of the biggest mistakes in the franchise's first movie. When Luke Skywalker succeeds in destroying the Death Star, he gets a hero's welcome back at the Rebel base. Princess Leia is so relieved, she screams out Luke's name - but it isn't "Leia" that actor Mark Hamill calls out in response. The actors have tried to cover up the gaff, but it's hard to miss Hamill calling his costar Carrie Fisher by her first name. With a cast as talented as the Guardians of the Galaxy, some improv is to be expected. But actual accidents, like star Chris Pratt dropping an all-powerful orb of universal destruction are a different story. Director James Gunn has confirmed that Chris Pratt really did drop the orb by accident, but stayed in character and finished the shot, meaning it could be still be used in the finished cut. Proving once and for all that it's nearly impossible to find where the actor's clumsy personality ends, and Peter Quill begins. The movie version of the Lemony Snicket novel series lived up to its name, but even in this series of unfortunate events, one happy accident made it through editing, thanks to Jim Carrey's famously quick thinking. When the movie's child stars meet their villainous uncle, he proves his career as an actor isn't limited to the stage, asking them for a second take. But the line wasn't in the script - Carrey actually wanted to try his line again, but stayed in character when asking his costars. Since the strange moment fit the movie's tone, the director decided to leave it in. Considered to be one of Alfred Hitchcock's best, and most parodied movies, there's one part of North by Northwest that all involved would rather forget. When the Star Cary Grant winds up taking a trip in the back of a police car, the actors rely on old fashioned tricks to make the ride seem more realistic to the audience. When the driver takes a hard left, Grant slides to the right like he's supposed to – while the other policeman misses the cue completely. Grant needed to give him a push, leaving audiences to wonder how the obviously blown take was the version Hitchcock left in the final cut. One of the biggest laughs of this horror comedy comes when one Cabin in the Woods character gets to see a kill from his favourite monster up close - too close. The scene was intended to be truly grotesque, as the Merman prop was rigged to pump out thick streams of blood as it consumed its victim. With the effect working perfectly, the crew decided they might as well let the blood tank empty out before stopping the camera. But it was only when the tank started to run dry that the flowing blood turned into erratic spraying, and every crew member began uncontrollably laughing. The tone changed immediately, and the director decided the joke was too good to leave out, swapping gore for a gag, and proving that behind-the-scenes luck can still result in movie magic. The heroes of Joss Whedon's Firefly were up against an entire planetary alliance in this big screen finale to the TV show, taking a suicide mission into enemy territory to get a life or death message to the public. But when the truth came out, even the crew of Serenity's main enemy decides they shouldn't be punished. Unfortunately, the director had planned to skip over the enemy soldiers standing down entirely - which meant he never filmed the scene. Getting creative, Whedon used footage of the end of the shot, when he shouted "cut!" and the actors simply lowered their weapons. It did the trick, but they weren't alone: look closely, and you'll see a crew member lowering their camera straight through the frame. The villain of this classic movie met her end by melting in water, but the actress got it much, much worse. When the Wicked Witch of the West makes her first exit from Munchkinland, she does so in a puff of red smoke, and a burst of fire. It's a memorable effect, but a pretty flawed one: not only can the trapdoor letting out smoke clearly be seen opening from the floor's set, but it begins to pour out before the Witch even hits her mark. So why was it left in the movie? 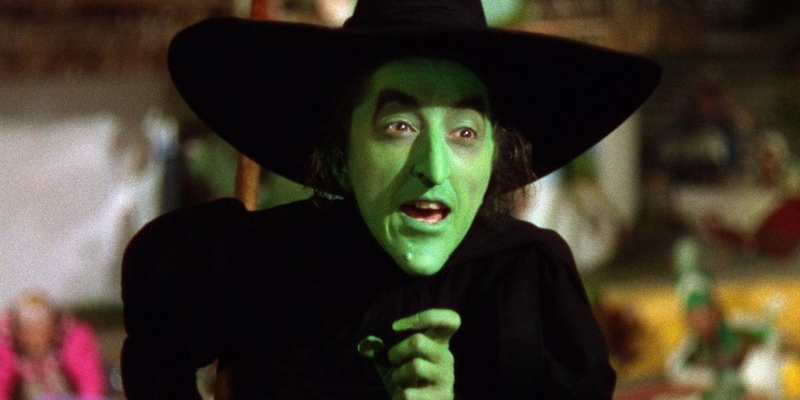 In a later take, actress Margaret Hamilton was severely burned when the fire erupted early, taking her out of action for almost two months. When the actress returned, she refused any more fire stunts, so the studio was forced to use a rehearsal take in the final cut, obvious errors, mistimed smoke and all. Even actors can get starstruck when working alongside mega stars like Tom Cruise, and his game was proving a problem even early in his career. Playing the part of NASCAR driver Cole Trickle in Days of Thunder, a head injury led to a love affair with his characters doctor. When the couple spent the weekend with Cole's former rival Rowdy Burns, introductions are made with Rowdy's wife Jenny. But she doesn't need to be told who her husband's famous friend is, greeting the actor with his actual name, "Tom." Somehow her flub - and Cruise ignoring her mistake - wound up in the finished movie. It's still hard to believe that director Robert Rodriguez is responsible for mature action movies like Desperado and the family friendly movie series Spy Kids. But it turns out that filming fewer action-packed scenes isn't necessarily that much easier. When Rodriguez was capturing an early shot of actress Carla Gugino in front of a set of mirrors, he made an unexpected cameo alongside her reflection. What should have led to a blown take and a good laugh was left intact, with Rodriguez apparently deciding his blunder was too funny to edit out. Arnold Schwarzenegger may be more acclaimed for his action skills than his comedy chops these days, but in the role of The Terminator, the actor could do no wrong. He even tried a little improv. When his battle with the more powerful T-1000 in the movie’s sequel left him severely damaged and losing limbs, he still managed to come to John Connor’s rescue. 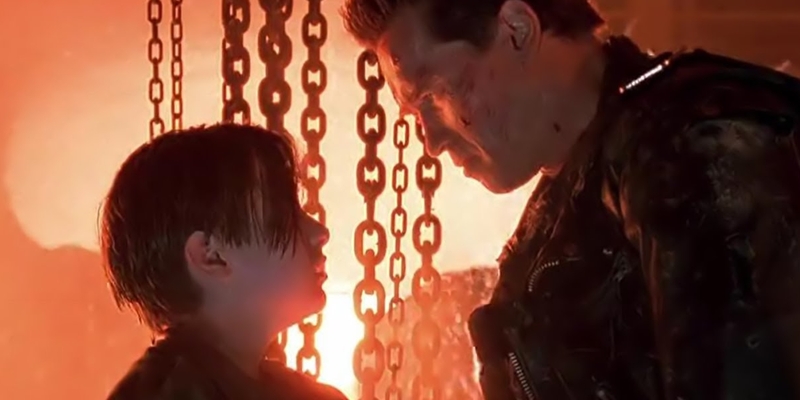 In the script, the Terminator had no line to speak after saving John, with James Cameron simply saying that he emerges “looking like he needs a vacaction.” After filming the scene several times, Arnold decided to give the director a laugh, turning his description into an actual line. It got a laugh, but Cameron decided it actually fit the character perfectly, and made sure that was the take he went with. So what do you think of our list? Did we miss any of your favorite outtakes or happy accident in blockbuster movies? Let us know in our comment section and don't forget to subscribe to our channel for more videos like this one.